Same as we did in the previous years, Lamb Brand has just launched new gifts in the Cook and Exchange Gift Scheme for the year 2015! This time we are offering a wider range of gifts which vary from 10 Proof of Purchase up to 250 Proof of Purchase. 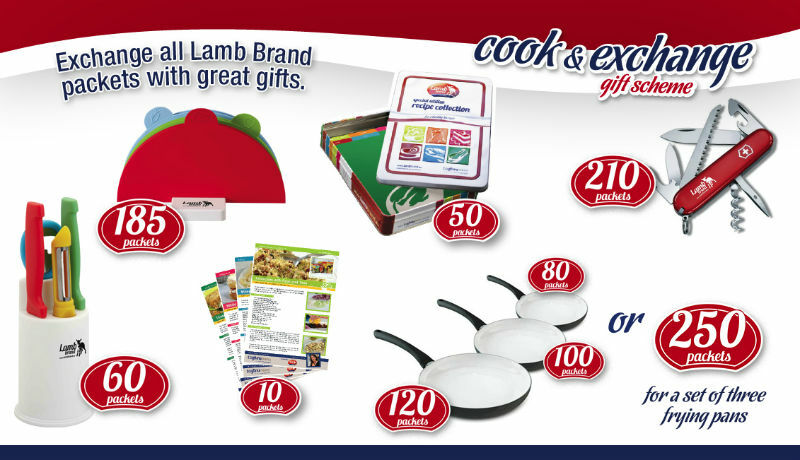 So do not forget to collect the Proof of Purchase found on each Lamb Brand product and exchange them for great gifts. With 250 Proof of Purchase we are giving out a set of 3 non-stick frying pans. You will save 50 Proof of Purchase. Each frying pan can also be redeemed on its own with the following proof of purchase, the Large Frying pan 24cm in diameter can be redeemed for 120 Proof of Purchase, the medium Frying pan 20cm in diameter can be redeemed for 100 proof of purchase whilst the small frying pan 16cm in diameter can be redeemed for 80 Proof of Purchase. With 210 Proof of Purchase you get a nice Stainless Steel Victorinox Swiss Knife. It’s the Victorinox Camper which has 13 functions. It consists of a large blade, small blade, corkscrew, can opener with small screwdriver, cap lifter with screwdriver, wire stripper, reamer, punch, key ring, tweezers, toothpick, and a wood saw. With 60 Proof of Purchase, you can get a nice colourful knife set. This set consists of a holder with 2 blade knives, a potato peeler and a bottle opener. For 50 Proof of Purchase you get a Special Edition Tin Box containing 50 recipes and with 10 Proof of Purchase you can get a pack of 4 recipes to be added to your recipe box.